This luxurious, subtly-spiced Curried Coconut Pumpkin Soup recipe will warm you from the inside out. It is naturally gluten-free, dairy-free, vegan, paleo and ready to eat in just 20 minutes! This easy-to-make soup is ideal for chilly weather and evenings when you want something simple and comforting. It is thick, full of flavor and comes together in mere minutes! It is perfect for meal prepping, so feel free to make a batch ahead of time to have on hand for the coming week. This Curried Coconut Pumpkin Soup recipe would be great for entertaining and taking along to fall and winter gatherings. Since it is naturally gluten-free, paleo and vegan, it is suitable for many people following special diets. Not only is this pumpkin soup recipe quick and easy, it is also extremely nutritious. Pumpkin is rich in Vitamin A, which is important for keeping your eyesight sharp. Pumpkin is also a good source of fiber, which keeps you feeling full for longer on fewer calories. Coconut milk gives the soup a rich and creamy consistency, without the use of heavy cream. A touch of curry powder gives it the slightest hint of warm Indian spices without being overly spicy. This soup has a silky texture because all of the ingredients get blended together until smooth. I prefer to use an immersion blender to puree the soup, but you can use a regular/traditional blender instead. Blend the hot liquid in batches and only fill the blender up until it is halfway full. Any more than that can cause a serious accident. Before you start blending, remove the center insert in the lid of your blender. Then, place your hand over top the lid with a dish towel and keep most of the hole covered. This is done to allow the hot steam to escape and prevent any splashes while the blender is running. 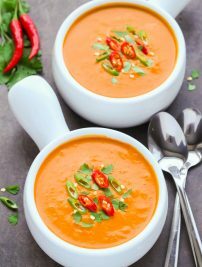 For more healthy gluten-free and vegan soup recipes, try my Thai Spicy Noodle Soup, Carrot Ginger Coconut Soup and Butternut Squash Apple Soup. Curry Powder – This is the curry powder I use! The quality is excellent and it gives a rich, fragrant and well-rounded flavor to soups and curries. Coconut Milk – I love the taste and consistency of this brand. It adds so much body and richness to dishes like this one. Immersion/Hand Blender – This is the one I use and love! I have had mine for years and it is one of my favorite kitchen tools. I use it all the time to make soups, smoothies and dips. This easy Curried Coconut Pumpkin Soup recipe is gluten-free, dairy-free, vegan, paleo and ready to eat in just 20 minutes! In a large pot, heat the oil over medium heat. Add onion and sauté for 4 minutes until softened. Add garlic, ginger and curry powder and cook for 1 - 2 minutes until fragrant. Stir in the pumpkin purée, broth and coconut milk. Increase heat to high and bring to a boil. Reduce heat to low, cover and simmer for about 10 minutes. Season with salt and pepper to taste. Serve hot, garnished with a drizzle of coconut milk and pumpkin seeds if using. The soup is meant to have a rich consistency, but if it is too thick for you, just add more broth or some water to thin it out. If you are not vegetarian or vegan, the vegetable broth can be substituted with chicken broth. Hi JoAnn! I can’t wait for you to try it either! 🙂 Let me know what you think when you do make it! Did you use full fat coconut milk or lite? So glad I made this. Next time it’ll be a double batch. Used as main meal for a busy-day dinner, served with toast. It was just the right amount for two adults. Nice and filling and even my husband (Mr Meat and Potatoes) really loved it. Took me about 30 minutes but it’ll be quicker next time, knowing the recipe. Thanks for this tasty addition to my repertoire! I made this yesterday morning to use up some canned pumpkin. I was disappointed because it seemed to be lacking some flavor. But when I served it for dinner at night it was delicious! It just needed to sit a bit. My husband complained that there wasn’t more – I saved some for tonight! I did add some cilantro at the end of the cooking process because I love it. Thanks for a great recipe! Hi Judy! I’m so glad you and your husband liked the recipe! Sometimes for soups/stews/curries they just need to sit for a bit so that the flavors can mingle and develop, so that makes sense. And I love cilantro too!! 🙂 You’re very welcome! This tasted pretty good, yet I miss it not having a tinge of sweetness to bring out the pumpkin flavor more. Other than the calories, do you have the specs for the amount of protein this would have for entering into a food app? Thanks for all the great recipes you blog about. I’m new to Keto and have managed to lose 2 pounds so far in a week of being on it. I’m feeling healthier already with more energy than I had when I was munching up carbs. Hi Liz! Thanks for your feedback. 🙂 Right now the only nutritional info I provide for my recipes is calories per serving, but you can try using the My Fitness Pal nutrition calculator to estimate the other nutritional information, such as protein, fat content, etc. 🙂 Wow good for you! Losing two pounds in a week is not an easy thing to do, so good job!! I would love to make this soup but would like to use roasted pumpkin instead of canned.. How much pumpkin would you recommend to use? I made this soup was iffy about flavor coconut curry and pumpkin seemed weird the only I added was dried peppers to give it a little kick! I love this recipe sweet tangy curry punkpin I taste it all it’s perfect I did add half a cup more of pumpkin so it wasn’t wasted but it’s delish!!!! Hi Maria! I’m so glad you liked the recipe! ? Dried peppers would definitely give this soup a great spicy kick! Thanks so much for letting me know! Yum! I added himalayan salt, cayenne pepper and black pepper. After using immersion blender, I put back on stove and added a small can of mushrooms. Very satisfying! Hi Julie! Those additions sound delicious! I’m happy you enjoyed the soup! 🙂 Thanks for letting me know! I really loved this recipe. I’m single so for me it’s just the right amount of soup for 3 meals. I drizzle a bit of plain yogurt on it. Next time I’ll add a touch of cinnamon. This soup is comfort food. This soup tasted delicious, the touch of ginger was lovely, I made this for my family who are not big soup fans and it was a hit! I will try this again soon! This is by far the best pumpkin soup I’ve ever tasted! I roasted the flesh of half a big pumpkin that I carved for Halloween, and made double the quantity.. I also added 3/4 tsp of turmeric to the spices… Gosh, what a dream! There were crunchy pieces of ginger in it! Thank you! Yogurt goes really well with it too, as somebody also mentioned. Hi Odette! Thank you so much, I really appreciate your kind words! Fresh roasted pumpkin would taste sooo good in this soup, and so would turmeric! I’m so glad you enjoyed the recipe! Thank you for sharing. This soup was super easy and so good. I actually used homemade beef bone broth and added a tablespoon of salt and 28 grams (2 tablespoons) of butter. I try to eat Keto. I split it into 4 – 1 1/2 cup size portions. I just had braces put on and needed some food I didn’t have to chew. Delicious! Hi! You’re welcome! I love homemade bone broth and it would taste fantastic in this soup. I’m so glad you enjoyed the recipe!